Before I went off to uni to study how to be more of a food nerd, I took a gap year. I worked in an independent kitchenware shop (which I adored! Selling knives, baking gadgets and all sorts of weird and wonderful things!) to save up for travels. As I was the only one of my friends who had deferred my place a year to travel, I had only planned to do the odd short trips throughout the year, such as Cologne for the Christmas markets, Seville for the April fiesta and New York for my birthday. Then luckily the summer before starting uni, my older brother and his girlfriend (who is like a sister to me) was graduating from uni and wanted to go travelling. And that’s how I finished my gap year in style, doing the classic month in Thailand, followed by a month in Australia before ending up in San Francisco for a few days. I was young and foolish – no I didn’t get a poorly designed tattoo or shave off half my hair, but thought that travelling for that long would cure me of my travel bug. Mwahaha…. yeah right. So after doing a year at uni and surprisingly not have spent all my money on beers and boys, I booked onto a tour that went from LA to New Orleans in two weeks. I needed to see the world, and this way meant I meet some awesome people from around the world (which four years on, still in contact with a lot of the nutters), party hard, see some sights and try all sorts of new food treats. One of the stops was in Memphis, the home to the home of the King. Elvis. Thank you very much. Graceland is crazy as you would imagine, The Jungle Room and the beautiful green carpet lining the walls with a row of TV’s, the barn converted to hold all of his shiny discs and jumpsuits. You can even stay in the Heartbreak Hotel if you need a bed for the night. The diner offerings was something else, all of Elvis’s favourite food, his mama’s meatloaf, fried chicken and the infamous fried peanut butter and banana sandwich. Not feeling that brave and saving myself for some Memphis barbecue for dinner, I didn’t try the sandwich. But did buy an Elvis recipe book and oven mitt- well when in Graceland….. And since that trip I’ve been wanting to pay homage to the King. 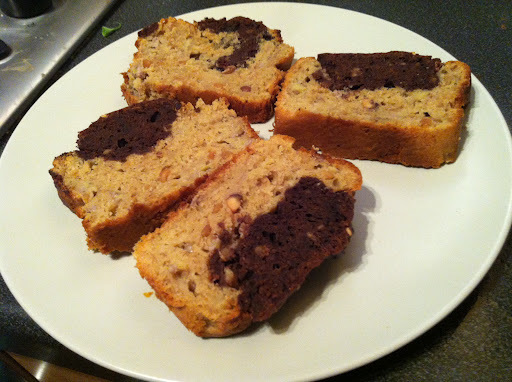 SO drum roll please……I give you the Fat Elvis Banana, Peanut Butter and Chocolate Loaf! Oven to 175C, Line a 9×5″ loaf tin and put to one side. In a bowl, beat the sugar and butter until light and fluffy. Beat in the eggs, one at a time. It’s gonna look gross, but promise it will come together! 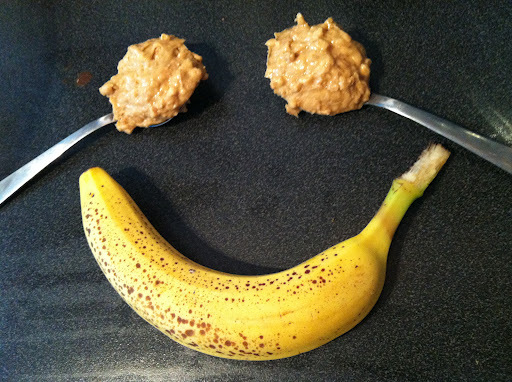 Mash the banana’s on a plate with a fork – keep some clumps to add texture to the loaf. 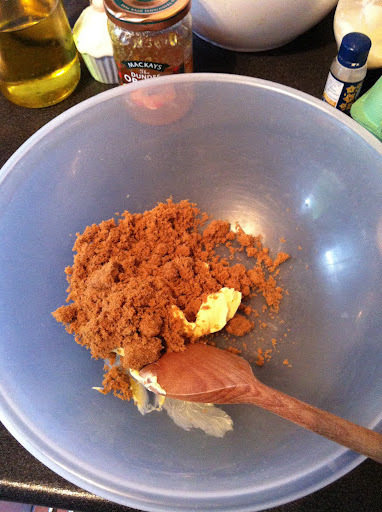 Fold into the egg/butter mixture, slowly mix in the flour and it will come together to more of a batter. Mix in the peanut butter, I used up a jar I had been working on, if you don’t fancy too much then don’t add all of it – simples. 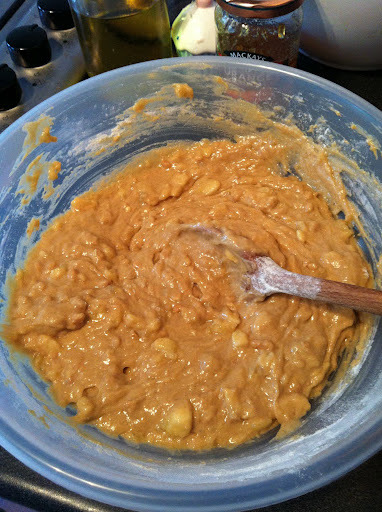 Spoon most of the mixture into the loaf tin, leaving roughly a third in the bowl. Add the cocoa powder to the remaining third in the bowl and mix well, if the mixture looks a little dry, add a splash of milk to loosen the mixture slightly. Spoon on to of the mixture in the tin, you can swirl the mixtures at this stage to marble the cake, I fancied just doing mine fairly straightforward. Bake in the oven for 45 mins to 1 hr, it will be a moist loaf but you want a skewer to come out clean and not raw mixture. 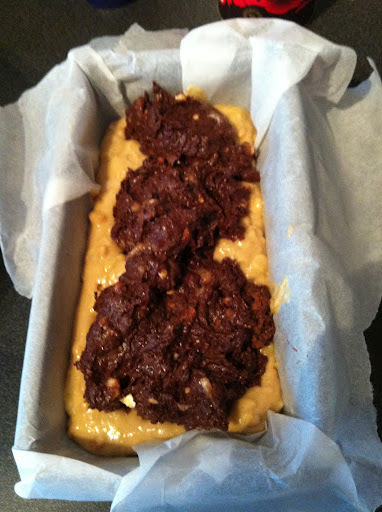 This loaf will look a bit rough around the edges – but tastes damn fine. Cool in the tin slightly before slicing into thick wedges, could even serve with vanilla ice cream. I want you to make this, wrap it up all pretty and give it to me on my birthday. And no I am not sharing.